Yale University Press author Patrick Lynch, using his widely researched and lavishly illustrated book A GUIDE TO LONG ISLAND SOUND as reference, will describe the evolution of Long Island Sound, one of the most densely populated regions in the US: the formation, geology, and ecosystems, both marine and terrestrial of the Sound, and the gradual effects of rising sea levels and warmer waters upon them. Supported by many years of environmental research, Patrick will disclose, and discuss, his predictions for sea-level rise throughout the region. 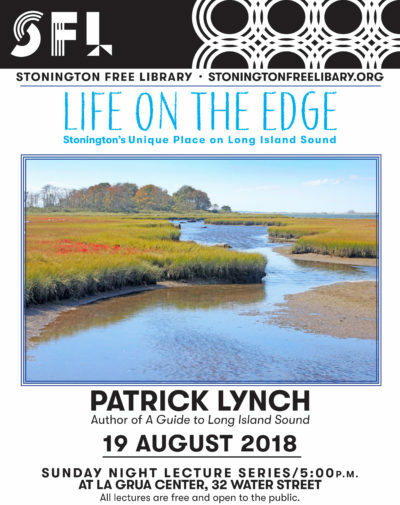 A GUIDE TO LONG ISLAND SOUND, Yale University Press, will be available at the talk: “Informative yet accessible and visually stunning” – AUDUBON CT.